Do you Facebook? Blog? How about YouTube? The Umbra Institute is plugged in with all three in an effort to help students see what it’s like to live in Perugia before they make their decision to come here. 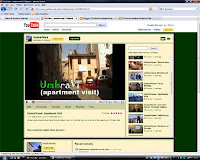 The Umbra blog documents the activities and day-to-day life while the Umbra Views YouTube page gives insights on Perugia life in tidbit-size bites: want to know about what your apartment could look like, what a pizza workshop entails, or what a Renaissance Art fieldtrip sees? And for those of you with Facebook (who’s without, though?) click here for our site.